SoundFjord, 28 Lawrence Road, London, N15 4ER, UK. 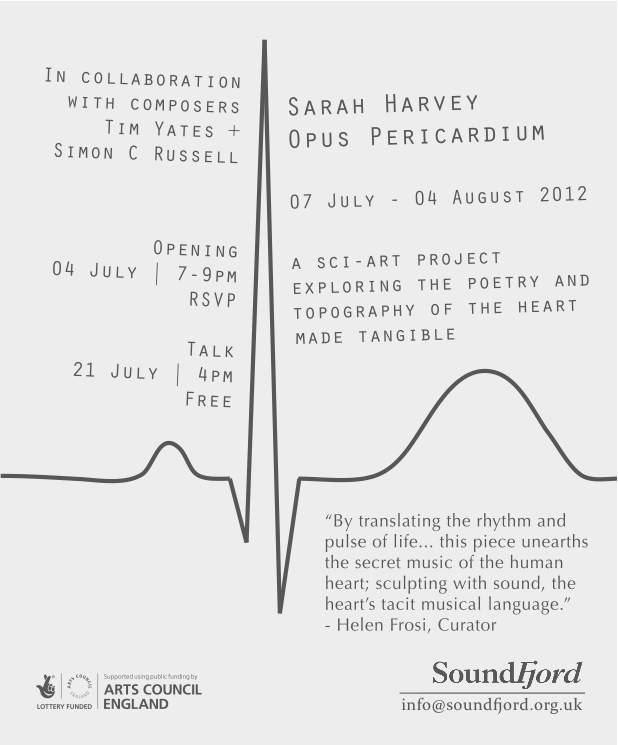 Opus Pericardium is Sarah Harvey’s first major exhibition working in collaboration with composers, Simon C Russell and Tim Yates. Opus Pericardium is a sci-art project exploring the poetry and topography of the heart made tangible. By translating the rhythm and pulse of life through the digital data of electrocardiogram readings, this piece unearths the secret music of the human heart; sculpting with sound, the heart’s tacit musical language. Sarah Harvey, Simon C Russell, Tim Yates, Professor Peter MacFarlane (Professor of Electrocardiology) and Richard Whale (Senior lecturer atBrighton and Sussex Medical School) speak in detail about the ideas that inspired the work, the ethical and conceptual issues that were raised during research, as well as the progress and outcome of their meticulous research linking artistic practice to scientific research and the confluence of both Science and the Arts. This entry was posted in Events and tagged heart sounds, medicine, music, sci-art. Bookmark the permalink. Composer, performer, historian, instrument builder, journalist, activist, kayak instructor, Bob Ostertag’s work cannot easily be summarized or pigeon-holed. He has published 21 CDs of music, two movies, two DVDs, and three books. His writings on contemporary politics have been published on every continent and in many languages. 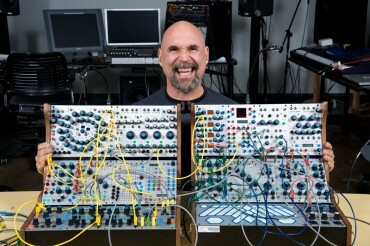 Electronic instruments of his own design are at the cutting edge of both music and video performance technology. The 2 day program will feature a series of lectures and intimate discussion sessions between Ostertag and the participants. On the evening of July 14, there will be a special concert by Bob, and brand new work by Jaap Blonk and Jonathan Reus. More info is available on the STEIM website. This entry was posted in Events and tagged body, masterclass, music, sound, technology. Bookmark the permalink. “MEDIATE Art Group is excited to announce the return of Soundwave this summer for its fifth season, entitled HUMANITIES, exploring our sonic connections to the human experience. Arguably the largest celebration of avant-art, sound and music in the Bay Area, Soundwave ((5)) HUMANITES will feature over 90 participating artists and musicians, in over 35 inspired performances, concerts, exhibits and conference panels & presentations over the span of 3 entire months. The Human Bionic features innovative instrumentation using the human body that questions the boundaries between the biological and technological. Artists Cantrell, Kuhne and Stuck imagine the hybridization of humans and technology with interactive performances utilizing brainwaves, muscles, sensors and human processing to create and conduct sound. Cantrell creates ‘Sounding Body’ an audience-interactive performance event that uses brainwaves to reveal how our thoughts can take various sonic forms. Multi-media artist Kuhne conjures ‘Rebound’ using videos and sensors to activate sound and image. Stuck presents ‘Pressed’ positioning the dancer’s real body between a symbolic language that directs movement and the video record of past movement. The Human Bionic explores our physical connection to technology while raising questions as to what is at stake, and what can be lost, by organic bodies and their interrelationships as technological implements become increasingly ubiquitous and essential in our current society. The Future Bionic looks pretty good, too; Jay Kreimer’s ‘Born Wireless’ sounds particularly fascinating and I hope to write a blog post about it soon (a naive proposition, perhaps, given that I am stuck in the UK and won’t be able to see it ‘in the flesh’). Other exciting offerings include: The New Humanity Conference: Technohumanity at Intersection for the Arts and The Meta Bionic at The Lab (featuring work by M+V (aka Tavis Johns & Paulina Velázquez), Guillermo Galindo, and NASSA ). For more info, check out the Soundwave ((5)) website. This entry was posted in Events and tagged arts, biofeedback, biosignal, body, brain, dance, event, interface, listening, music, sound, technology. Bookmark the permalink.